The pump manufacturer's app allows plant operators in the food and beverage industry to check their fixed-speed pumps for energy efficiency. It is available for smartphones and tablets and does not require information on the individual characteristic curve or other technical data of the pump set in question. The app determines the load at which each centrifugal pump driven by a fixed-speed asynchronous motor is being operated. 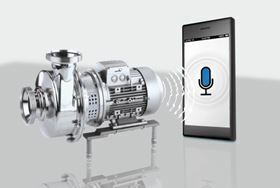 When the measurement routine starts, the microphone built into the smartphone or tablet is used for approximately 20 seconds to record the noise emitted by the fan of the electric motor. The four type series Vitachrom, Vitacast, Vitalobe and Vitaprime for food and beverage applications will be the focus at KSB's stand in Nuremberg. Thanks to the wide range of variants available with these pumps, nearly all tasks in relation with the hygienic handling of liquid and viscous fluids can be fulfilled. All pumps belonging to the Vita series have been awarded the certificates common to the industry, and their elastomer components conform to FDA standards. A great share of valves used in the beverage industry is pneumatically actuated. The multi-functional AMTRONIC valve control unit for pneumatic actuators is particularly suited for use in brewery and beverage applications. To represent the extensive KSB valve product range, SISTO-C diaphragm valves will be on display alongside gate valves and shut-off butterfly valves. SISTO-C's components are made exclusively of high-alloy, austenitic materials.